My cookbook is a personal collection of my best recipes for the last 40 years and includes recipes that have been shared with me by special friends. What makes my cookbook unique is that I have Parkinson's Disease and all contributors either have PD personally or know someone who does. This book is a not for profit book with all profit being donated to the Michael J. Fox Foundation for PD Research to help make advances in treatment and/or find a cure for this disease. 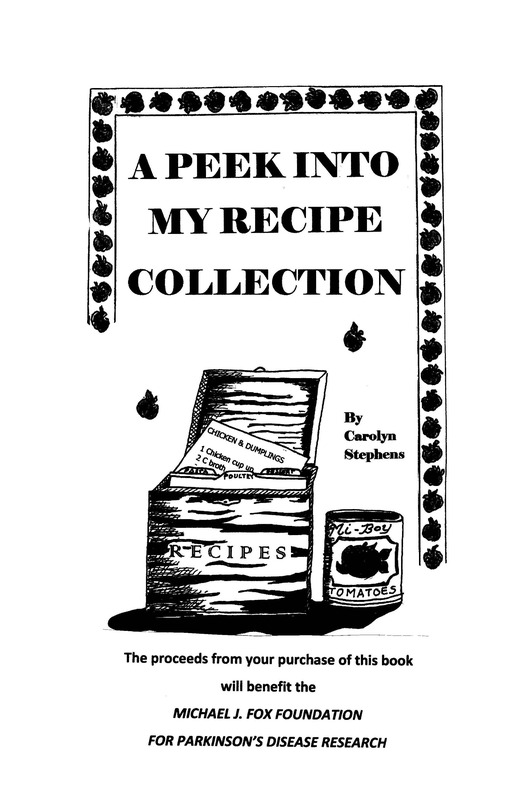 The book is a broad collection of wonderful recipes that my family thought were "keepers" over the years. Some recipes include anecdotal stories about the recipe that make it special. Preheat your oven to 350º. Line 24 muffin cups with cupcake liners or spray with nonstick cooking spray. Combine all ingredients (except icing) in a bowl and mix with a hand mixer on medium for 3 full minutes. Fill each muffin cup 2/3 full and bake for 20-25 minutes. Test for doneness by inserting a wooden toothpick into 1 cupcake. If it is not quiet done return it to the oven for a few more minutes.FOR ICING-Cream the butter in a bowl. Add the remaining ingredients and beat 1-2 minutes. If it is too thin add a little extra sugar. If it is too thick add a few drops of milk. Frost cupcakes and dust with a little more cinnamon.